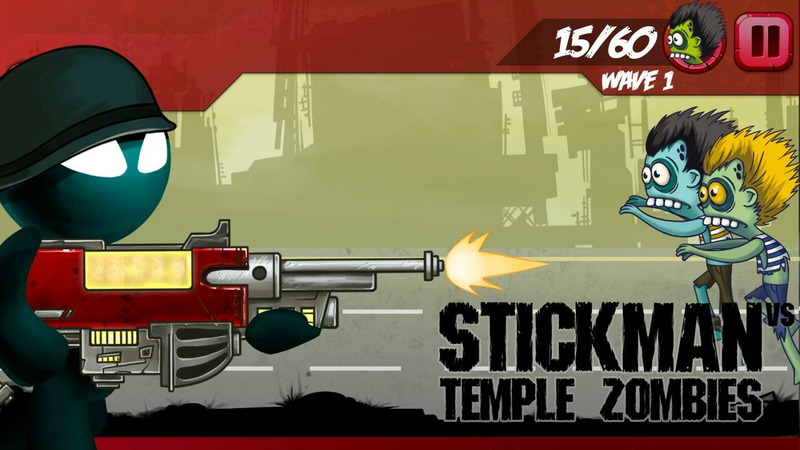 Stickman vs Temple Zombies – hit action-strategy adventure gamewhere you should defeat legions of zombies. This time, you arereally in trouble. And it's not about World War or tsunami thatrushed to the city. Highways, gardens where were so many differentplants, even frontiers of countries are full of these stupidmonsters who likes brains. Zombie. 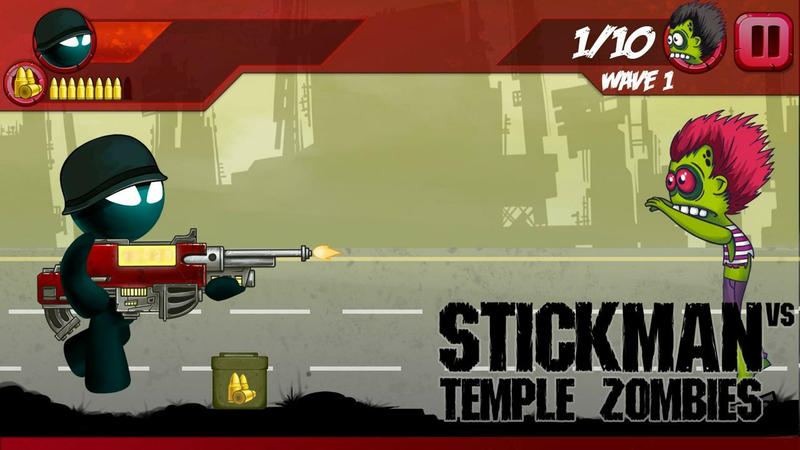 So, fight with your army of thepowerful stickman, supercharge them with powerful weapons andprotect your brain.Stickman vs Temple Zombies Features:Just use themouse to aim and click on your enemy to shoot.Sometimes you needtwo or even three shots to kill zombies.Every wave of the attack isa bit stronger than the previous one, like in real tsunami.Don'tforget to overcharge your gun if you have used 10 shells. Anew adventure every time. Catch all zombies, aim the shotgun on thetarget, trigger the rifle.Prove that it is easy to kill undeadmonsters. 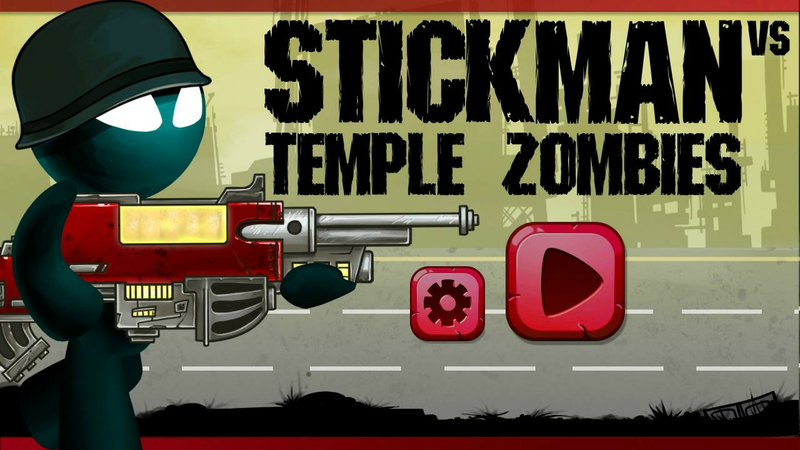 Plot your winning strategy with stickman army.Stickman vsTemple Zombies – one stickman with shotgun and lots of zombie. Spore in Virtual World 3D – this game will put you in control of amicroorganism in a virtual world. Now you have a chance to developa species from microscopic organism to supermassive one in 3dimensional format. Complete all stages of evolution by craftingyour own pet monster with Spore in Virtual World 3D.Do you knowwhat is the main rule of evolution? If you see other monsters, whoare less than you, eat them. Remember, if you want to survive, youshould eat more, evolve. Take part in this bio war of micro worldwith angry creatures! Spore in Virtual World 3D Features:Customizeyour character just by eating others.Compete in daily eventsagainst all creepy monsters in the world of spore.Complete allstages of evolution from little spore to the supermassive one.Playyour way. Create your tiny monster anyway you like. Craft, trainand care of it. Evolutionary process will never stop. Evolveagain!Spore in Virtual World 3D – world of spore and evolution iswaiting for you. Auto Craft Mechanic Sim – craft your own racing vehicle and takepart in the race.Build, craft and explore this cube-filled universeon your own wheels. This is gonna be grand racing among cubic worldcities. But firstly, you need to craft your car. Engine cylinder,dispensing mechanism, cell tank, petrol pipe, brake disc and otherelements special for the future grand race champion.Now we willtest not only your driving skills, but also how good you are atcrafting. Block by block craft your car, test it before your mainadventure. Rise to the top of craft racing world. This simulatorand grand racing game will not let you stop! Auto Craft MechanicSim Features:It's not lust a simulator game, it is like in realblock craft world!Creative mode and adventure mode now in the worldof race.Show your driving skills and don't get shaking off.Experience all the excitement of the competition and the dynamicsof the race in 3D and cube-filled universe.Craft your car byyourself and enjoy our 3D cubic race.Craft more, drive more and getmore details for your car with Auto Craft Mechanic Sim. Step back in time and you will get to the dinosaur reality, aplanet full of these giant animals. Do you want to see these hugeand strong beasts and their life? Carnivores will be walking allaround you, as many years ago. What an exiting experience in thiscool game Dinosaur Assassin!Characteristics of the game DinosaurSurvival:Life in the Jurassic era was very hard andcruel. Different species was fighting for a place in thesun. Raptor with tyrannosayr or diplodocus with proceratosauror vise versa. Use your arms, equip powerful weapons and thinkabout the strategy.Don't be afraid, look at them through yourphone, they will not hurt you. Journey to a dinosaur's battleworld, chose who you want to be and try to win your fight. Beruthless and tough enough to reach the final level and become theultimate winner in this game.There is one rule - hunt or you willbe hunted! Dino park is a dangerous place, survive among yourfurious rivals.Dinosaur Survival - master your skills in thishunting game on your mobile device. Creepy Girl Hologram is a brand new technological feature, thatmakes holograms in real life. You can see and touch virtual spore,surpise your friends with it or even take a photo of them standingnear the tiny spore organismHologram Simulator – nice to see you inthe land of tomorrow, Future is nearer than you think. New ITtechnologies come to the world. Now a film fantasy comes true! Whatyou can do: download this app, launch the game. You will see thecamera that will help to project the model IN REALITY! DON’T FORGETto print first the image, that you will use for projection of 3Dmodel. Virtual life gives you so many advantages, we are sure thatyou like hero or pixel games, because you like to live amongstrange graphic world. It won’t be a surprise if in the future youhave your virtual clone done in horse head style. It will be thereal clash of virtuality and heaven! By downloading this game youwill craft your own FUTURE!Creepy Girl Hologram features:-Manydifferent models you can find in our Hologram Apps: bikes, guns,cat, racing car, and even pretty girl- Future in your smartphone-Shock all your friends by new technology- Realistic graphicSimulatorCreepy Girl Hologram – walk in step with future ITtechnologies!____________PRINT THIS IMAGE AND DIRECT YOUR CAMERA TOIT:http://itwork.mobi/hologram/mark.jpgMake sure that you openedthe application.Play with 3D models and do superb screenshots ofthem! Mine Ragdoll Tournament - a new fighting game with ragdoll.Addictive beat'em'up game with realistic physics and hardcoregameplay is waiting for you.Perform death-defying motor stunts,crash into walls, create traffic pile-ups of epic scale - and sharethe fun! In this game you have to fight with a ragdoll enemies on avariety arenas. Arrange a duel and fight in the world of craft andmines cubes. Mine Ragdoll Tournament – what can you expect here?Boost your enemy, drag him, bang him and he will jump and yell allover the place. You are a warrior, so kick opponents as much as youcan, get the scores.Pick it up, push, poke and pulverise it all inglorious 3D.Ragdoll means breaks, a lot of screams and fun. Comeon, lets go play!Mine Ragdoll Tournament Features:With simplecontrols you can perform amazing stunts and blows to defeat youropponents. Realistic ragdoll physics and dynamic gameplay. Prepareyourself for hours of fun and entertainment! Get achievementsfor special stunts. Endless playing for everybodyMine RagdollTournament – have fun producing complex dismount! There are ancient legends about power of the ice. That it can makeeverything and everybody around ice. That is what happened in ournew game Ice Crush.Be ready to face a new challenge. And this timeit is not about to fight with heroes and darkness or race fortreasures of pirates. Your new mission is much better. You need tohelp these cute animals. They have been attacked by frozen force.Everything around became a land of ice. And our heroes becamefrozen. Swipe a screen of your phone to break the ice. IceCrush:Cute characters will not let you be bored.Play a mini game tosave animals.Enjoy the unique world of ice.Embark on a fun andfrozen journey through the Ice universe! Ice Crush - how towin in the battle against ice? Swipe! As faster as you can and letthem be free! Craft Hologram Simulator is a brand newtechnological feature, that makes holograms in real life. You cansee and touch virtual spore, surpise your friends with it or eventake a photo of them standing near the tiny spore organismHologram Simulator – nice to see you in the land of tomorrow,Future is nearer than you think. New IT technologies come to theworld. Now a film fantasy comes true! What you can do: downloadthis app, launch the game. You will see the camera that will helpto project the model IN REALITY! DON’T FORGET to print first theimage, that you will use for projection of 3D model.Virtual life gives you so many advantages, we are sure that youlike hero or pixel games, because you like to live among strangegraphic world. It won’t be a surprise if in the future you haveyour virtual clone done in horse head style. It will be the realclash of virtuality and heaven! By downloading this game you willcraft your own FUTURE!Craft Hologram Simulator features:-Many different models you can find in our Hologram Apps: bikes,guns, cat, racing car, and even pretty girl- Future in your smartphone- Shock all your friends by new technology- Realistic graphic SimulatorCraft Hologram Simulator – walk in step with future ITtechnologies!____________PRINT THIS IMAGE AND DIRECT YOUR CAMERA TO IT:http://itwork.mobi/hologram/mark.jpgMake sure that you opened the application.Play with 3D models and do superb screenshots of them! Crossy Hologram Sim is a brandnewtechnological feature, that makes holograms in real life. Youcansee and touch virtual spore, surpise your friends with it oreventake a photo of them standing near the tiny spore organismHologram Simulator – nice to see you in the land oftomorrow,Future is nearer than you think. New IT technologies cometo theworld. Now a film fantasy comes true! What you can do:downloadthis app, launch the game. You will see the camera thatwill helpto project the model IN REALITY! DON’T FORGET to printfirst theimage, that you will use for projection of 3D model.Virtual life gives you so many advantages, we are sure thatyoulike hero or pixel games, because you like to live amongstrangegraphic world. It won’t be a surprise if in the future youhaveyour virtual clone done in horse head style. It will be therealclash of virtuality and heaven! By downloading this game youwillcraft your own FUTURE!Crossy Hologram Sim features:-Many different models you can find in our Hologram Apps:bikes,guns, cat, racing car, and even pretty girl- Future in your smartphone- Shock all your friends by new technology- Realistic graphic SimulatorCrossy Hologram Sim – walk in step with futureITtechnologies!____________PRINT THIS IMAGE AND DIRECT YOUR CAMERA TO IT:http://itwork.mobi/hologram/mark.jpgMake sure that you opened the application.Play with 3D models and do superb screenshots of them! Zombie attack 2 is one of the best adventure, zombie shooter rungame. Zombie Attack 2 is a 2D adventure game with shooting thezombies to survive in a zombie world. Zombie attack 2 will be oneof the best adventure shooting game in just 10 MB.Zombies attackedthe plane of the last survivors all the warriors are lost in theforest. One of the warrior start fight against the zombies in thatforest which is full of zombies to rescue his friends and to leavethat area as fast as possible. Help the warriors to fight againstthe zombies in that zombie world. They have just one rule “ Kill orbe killed”. Kill as many zombies as you can and rescue each of thewarrior and escape from that zombie forest. The Zombie virus hasspread like wildfire around the world. Everyday millions peoplehave been transformed into zombies that will kill any living thingthey come across. Help our hero's to fight back against zombies andprevent zombie attack.Run and destroy as many zombies you can evensome plants are changed to zombies, just jump above them, it cannotbe destroyed. FEATURES* Stunning graphics with inspiring music andsound effects in just 10 MB. * A map based adventure shooting gamewith addictive and interesting gameplay. * 4 Different worlds. * 8Hero’s with different weapons. * 24 different zombie types. * 8 BossZombies. * Zombie plants. * 4 vehicles to use [car, jeep, truck,APC]* Easy Controls. * Unlimited ammo.How to play zombie attack 2*At screen left we can see navigation button, press left to moveleft and press right to move right. * Tap the jump button on rightof screen, press twice for double jump. * Tap the fire button onright of screen to shoot the zombies. * Run and kill all zombieswhich attacks you. Play The walking zombie: Dead city, zombie shooter game that takesplace in the scary near future. Terrible epidemic made world fullof zombies and now you must fight to survive! Fight various zombies(zombie prisoners, zombie dogs, zombie cheerleaders, gunmen or epicboss monsters) with more than 10 different weapons! Enjoy greatcartoon graphics and try to survive zombie apocalypse with yourreliable 3D pixel gun that can be upgraded to inflict more damage,be more accurate, reload faster or have more ammo. Day by day,enemy by enemy, no walking dead can remain unkilled if you andentire human race should survive. Zombie games were never moreentertaining! Features: * Epic 3D pixel cartoon graphics * Zombiesreacting to being hit and falling apart with multiple hits -effects on various dead are different * Intuitive controls makingzombie killing much more fun * 20+ different zombie types -shooting zombie, dog zombie, prisoner zombie etc * Huge bossmonsters * Arena bonus mode - kill as many zombies as you can usingonly melee weapon * 10+ different weapons, from revolver andassault rifle to overkill weapons like rocket launcher, you don'tneed to fear the walking dead anymore * Many maps with differentvisual themes and enemy routes * Hit zones - many enemies will falldown after precise kill shot to the head * Shooting games are aboutskill - survive with enough health and have high % of headshots andget bonus rewards! * Rail shooter The world after zombie apocalypseis dangerous place, but you are ready for its challenges! Pick upweapon and have some fun with zombie shooting - don't stop yourtrigger until all dead are...completely dead. Get reward for yourhard work and unlock new weapons, upgrade current ones and justkill as many walking dead as possible. This is a zombie game whereyour skills really matter! In the world of The walking zombie: Deadcity, you can have only one of these two roles - either zombiekiller or zombie dinner. The walking zombie: Dead city is freezombie killing game so don't worry, you will only lose your fleshand brains in worst case scenario. Shooting games are always fun,but this one will take take your heart (and brains). Discover the monster world! Begin crafting your weapon at day andbuilding defenses at night! Can you survive five nights and holdoff a living dead army of zombies, ghosts and other monsters?Horror adventure begins! Jump into a blocky cube city invaded byevil scary monsters! Prepare to fight off hordes of such spookycreatures like a zombie, ghost, mummy and undead clown! It’s a truehorror adventure game. Survive a night! You’d like to close youreyes but crafting weapons and upgrades is a better way to handle anight fear! Build a blocky cube wall and other defenses. Make surethat every zombie, ghost, mummy or clown will be dead by dawnlight! How long can you survive? One, two or five nights? Test yoursurvival skills in our brand new horror adventure game! No fear!Chat with other NPCs (not real people!). You can even find agirlfriend or boyfriend! What’s better than love in the zombieapocalypse times? Craft, build & explore a scary world at dayYou won’t see any dreadful monster at day - enjoy free explorationexperience! Craft & mine resources! Look for supplies in avast, sandbox blocky world. Pay a visit to the scary hospital,haunted mansion or forgotten mine. Search a spooky old cemetery anda city garden - you can set plants there! Gather resources to craftbetter weapons and upgrades! Prepare for the night! Before zombies,mummies and other living dead will storm off, you have to enhanceyour fortress! Build wall and other defenses from blocks. It’s nota game for little boys and girls! Scary horror adventure for realmen, who won’t run away seeing such a spooky night monster like azombie, ghost or clown! Best zombie apocalypse survival game withexploration mode for boys and girls! For free! Hold back anymonster and survive another night! You’ve been exploring, craftingand building all day long - hopefully you’re prepared for thenight! A true battle begins! Blocky cube zombies, ghost, mummiesand any other living dead will try to break into every building.Don’t hide in a dark room of a hospital, haunted mansion. Undeadstupid monsters have their eyes on you! Unload your blocky cubeweapon and shoot any monster zombie or ghost you see! This scarybattle won’t end until the dawn - prove you’re skilled not only atcrafting & building, but also as a spooky zombie hunter! Everydead target must be dead by dawn light - for good! Fight evil &fear for five nights or even longer! This survival horror adventuregame never ends! CORE FEATURES: Exploration of a world with terrorslike the living dead, zombie or ghost! Build defenses from blocksand survive another day! Craft and upgrade weapons! Crafting &building at day, hunting monsters at night! Blocky cube horroradventure for boys and girls! UPCOMING FEATURES: Multiplayer mode! (multicraft) Co-op mode! More scary environments to explore! Moreresources to mine for crafting & building! (design craft) Moremonsters to fight with!